In June, 2018, Reuters announced the Top 75 universities ranked in "Asia Pacific's Most Innovative Universities - 2018". 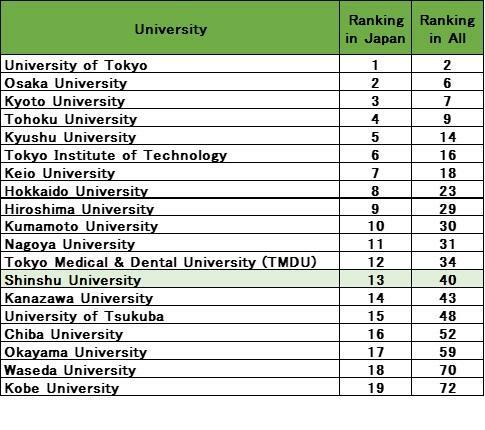 Shinshu University ranked 13th in Japan and 40th in all (In 2017, ranked 14th in Japan and 44th in all). Compiled in partnership with Clarivate Analytics, the ranking is based on data including patent filings from Derwent Innovation™ and research paper citations from the Web of Science™. For detailed information about the ranking, please see the following website. "Asia Pacific’s Most Innovative Universities - 2018"
"Asia’s Most Innovative Universities - 2018 #40 Shinshu University Japan"
"KAIST, University of Tokyo and POSTECH Top the Annual Reuters Ranking of Asia Pacific’s Most Innovative Universities for 2018"